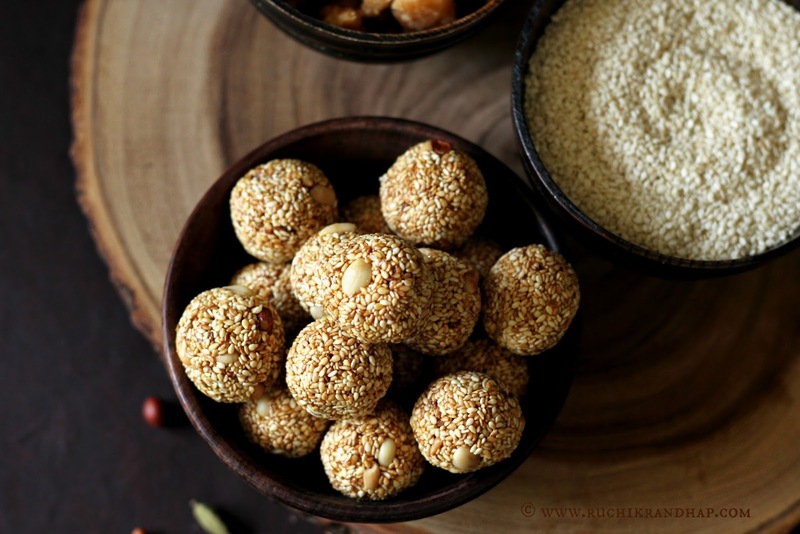 One of my most favourite items on the traditional Mangalorean Kuswar platter are the til laddoos or sesame seed balls that are pan India. These are an integral part of various cuisines and they are pretty popular as a sweet down South India too. In Mangalore they are sold in bakeries all year round and are particular popular during Christmas and Sankranti festivals. TiLache laadu as we call them in Konkani are an excellent source of copper, magnesium, calcium, iron and dietary fibre to name a few. They are beneficial to people of all ages and a must have at least occasionally. Since jaggery instead of sugar is used to bind the seeds together they can be considered to be a guilt free snack/sweet. Til laddoos are really easy to make. They need a few basic ingredients and very little time and effort to put them together. All you need to do is take care not to burn the seeds while roasting them. Perfectly roasted sesame gives out a great aroma and taste. 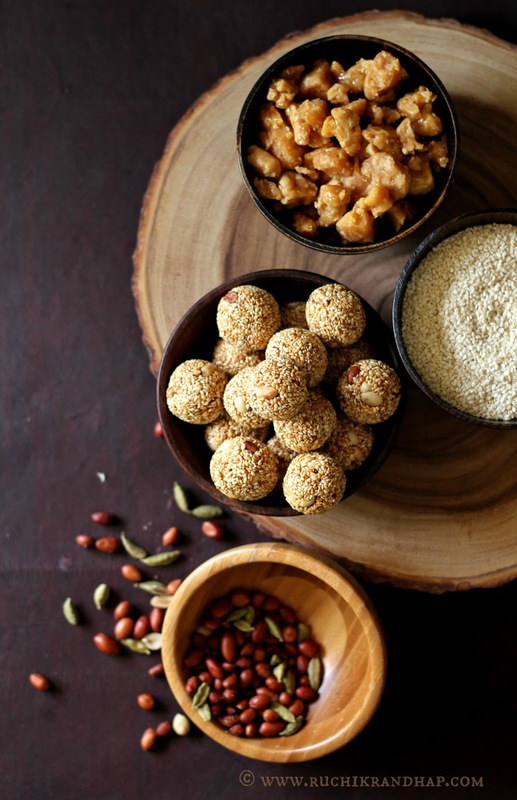 If they are not roasted properly the laddoos will taste slightly raw and chewy. 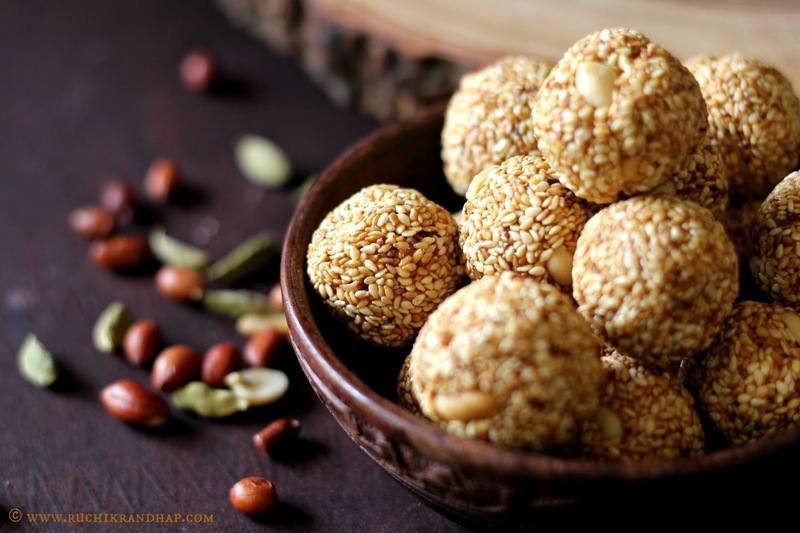 These laddoos need to be firm and crunchy. One bite and all you want is more! Do make them this Christmas. They are not just tasty, they are healthy too! 1. Dry roast the sesame seeds in batches on a heavy based, wide tawa/skillet till golden brown. Make sure the sesame has enough space on the tawa so that all the seeds roast properly at the same time. Remove onto a large plate to cool. 2. Add the powdered cardamoms and peanuts to the sesame and mix. 3. Before you start making the jaggery syrup keep a small bowl of water ready. This is to test the readiness/stickiness of the syrup. In a heavy non-stick saucepan/kadhai/wok heat the ghee and add the jaggery and melt it on a medium heat till it begins to froth and the colour changes from amber to rust (dark brown). Put a drop of the syrup into the bowl and if settles at the bottom of the bowl like a blob without dissolving and hardens when you scoop it out of the water it is ready. (When the syrup is not ready it will dissolve in the water). When the syrup reaches this stage remove the saucepan from the heat immediately and add the reserved sesame seed mixture and mix well. 4. Let the mixture cool for a couple of minutes but don’t delay too much. Apply a few drops of ghee to both your palms and start by pinching out small portions of the mixture. Without applying too much pressure roll to form smooth balls and keep aside on a plate to cool completely. 5. 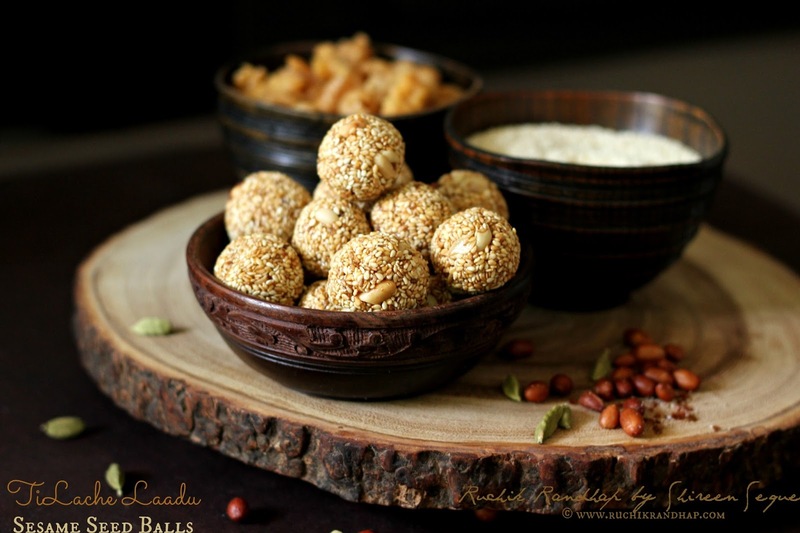 Once the laddoos have cooled completely store them in an airtight container. These laddoos stay fresh for at least a week if they last that long! Enjoy! 2. 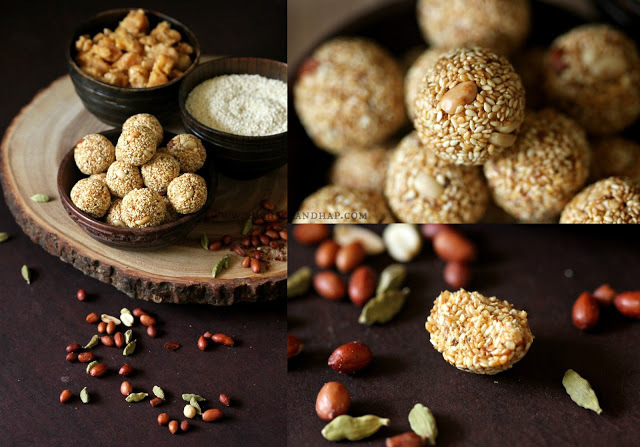 If you don’t have laddoo jaggery you may substitute it with regular jaggery. Just add 1 tablespoon of water to the jaggery and melt it over a medium heat. This type of jaggery may take slightly longer to come to the desired sticky consistency but it will work just as good. 3. Seeds that are not adequately roasted will remain white and taste raw when you bite into them. They need to be roasted on medium heat – not too high, not too low. Keep an eye out as they can burn easily if you increase the heat. Patience is a virtue! 4. If the syrup hasn’t reached the right consistency it will lead to laddoos that are chewy and soft. Til laddoos need to have a crunchy bite and not be like. Take care not to roll the mixture too tight or upon cooling the jaggery will make the laddoos too hard to bite. Roll gently and lightly so they are kind to your teeth as you bite into them.